For other people named Robert Jordan, see Robert Jordan (disambiguation). James Oliver Rigney Jr. (October 17, 1948 – September 16, 2007), better known by his pen name Robert Jordan, was an American author of epic fantasy. He is best known for the Wheel of Time series, which comprises 14 books and a prequel novel. He is one of several writers to have written original Conan the Barbarian novels; his are highly acclaimed to this day. Rigney also wrote historical fiction under his pseudonym Reagan O'Neal, a western as Jackson O'Reilly, and dance criticism as Chang Lung. Additionally, he ghostwrote an "international thriller" that is still believed to have been written by someone else. Jordan was born in Charleston, South Carolina. He served two tours in Vietnam (from 1968 to 1970) with the United States Army as a helicopter gunner. He was awarded the Distinguished Flying Cross with oak leaf cluster, the Bronze Star with "V" and oak leaf cluster, and two Vietnamese Gallantry Crosses with palm. After returning from Vietnam he attended The Citadel, where he received an undergraduate degree in physics; after graduating he was employed by the United States Navy as a nuclear engineer. He began writing in 1977. He was a history buff and enjoyed hunting, fishing, sailing, poker, chess, pool, and pipe-collecting. He described himself as a "High Church" Episcopalian and received communion more than once a week. He lived with his wife, Harriet McDougal, who works as a book editor (currently with Tor Books; she was also Jordan's editor) in a house built in 1797. On March 23, 2006, Jordan disclosed in a statement that he had been diagnosed with cardiac amyloidosis, and that with treatment, his median life expectancy was four years, though he said he intended to beat the statistics. He later posted on his Dragonmount blog to encourage his fans not to worry about him and announce that he intended to have a long and fully creative life. Jordan died at approximately 2:45 p.m. EDT on September 16, 2007, and his funeral service was held on Wednesday, September 19, 2007. Jordan was cremated and his ashes buried in the churchyard of St. James Church in Goose Creek, outside Charleston, South Carolina. Jordan's papers can be found at the Special Collections at the College of Charleston. ^ "Robert Jordan" was the name of the protagonist in the 1940 Hemingway novel For Whom the Bell Tolls, though this is not how the name was chosen according to a 1997 interview he did on the DragonCon SciFi Channel Chat. ^ Byrne, Bob. "Walking Through the Valley: What I'm Reading – 8/26/10 " (review), August 31, September 1, 2010. ^ Ross (September 2005). "Radio Dead Air Interview with Robert Jordan". Radio Dead Air. Retrieved 2012-04-16. ^ "Science Fiction Book Club Interview with Robert Jordan". SFBC. January 2001. Retrieved 2012-04-16. ^ Aan'allein (2001-04-04). "Leiden Signing Report". Emma de Laat. Retrieved 2012-04-16. 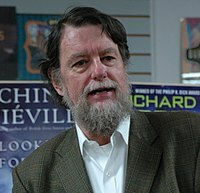 ^ "Barnes & Noble Chat with Robert Jordan". Seven Spokes. 1997-11-11. Retrieved 2012-04-16. ^ Tahir Velimeev (September 2000). "Wanderer Fantasy Convention - Interview with Robert Jordan". Theoryland. Retrieved 2012-04-16. ^ a b Jordan, Robert (2007-06-01). "(untitled)". Dragonmount, the Robert Jordan blog. Archived from the original on 2007-07-05. ^ Denzel, Jason (2007-09-27). "My Journey to Robert Jordan's Funeral". Dragonmount, the Robert Jordan blog. Archived from the original on 2007-10-11. ^ "Robert Jordan and the Wheel of Time". Archived from the original on 2007-10-12. Retrieved 2009-08-10. ^ "Statement from Robert Jordan about his health in Locus Magazine". ^ Jordan, Robert (March 25, 2006). "Important note". Tor Books. ^ "Jordan's death". Dragonmount. Retrieved 2011-11-28. ^ "The Post and Courier". Charleston.net. 2007-09-20. Archived from the original on 2012-07-21. Retrieved 2011-11-28. ^ "Robert Jordan (1948 - 2007) - Find A Grave Memorial". Findagrave.com. Retrieved 2011-11-28. ^ ""The Stone" - Entry in Robert Jordan's Blog at Dragonmount, dated October 6, 2008". Dragonmount.com. Retrieved 2011-11-28. ^ "Inventory of the James Oliver Rigney, Jr., Papers, 1905-2012". archives.library.cofc.edu. Retrieved 2019-01-07. "Robert Jordan". The Times. September 19, 2007. Retrieved September 22, 2007.